To get into the Christmas spirit, the choir program at the high school and Hy-Vee are partnering up to have kids go sing for the public around Cedar Falls and Waterloo Hy-Vee locations. With winter fast approaching, Hy-Vee wanted their customers to feel the spirit and shop with festive holiday music up until Christmas. Every weekend on Saturday and Sunday from 10 a.m. to 2 p.m., there will be carolers singing and performing for local shoppers and parents that want to listen. Located near the front of the store and checkout area, people walking in and leaving the store are able to hear and enjoy the music being sung. With a collection of classic Christmas songs in their repertoire, there won’t be a shortage of holiday cheer in Hy-Vee until the end of the holiday season. The carolers take time out of their own weekend to perform for shoppers. With groups made up of around 10 people depending on schedules of the singers, it’s a small amount of people doing something good. In return for singing, they’re given food from Hy-Vee and a place to sing and become better musicians over the time between upcoming holidays and concerts. Other than performing at near by Hy-Vee locations around town, they’ll perform at the upcoming winter choir concert held at the high school. Carolers enjoy the singing and the time spent with friends. 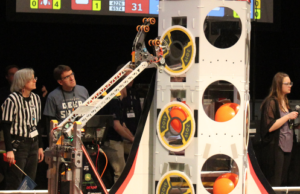 With the incentive of free food from the buffet and food choices at Hy-Vee as well, it’s a fun way for the students to spend their weekends together. 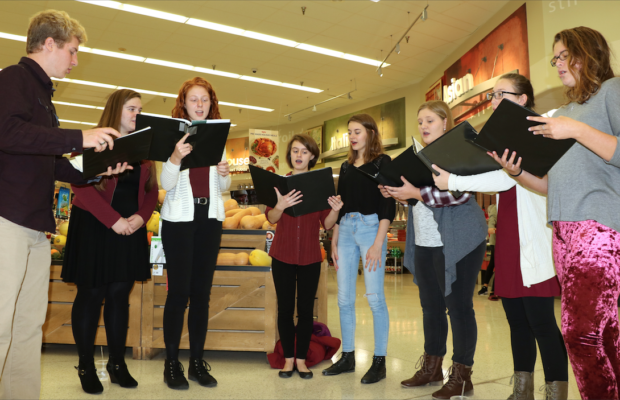 With positive attitudes and tons of holiday cheer, the group members sing their hearts out for the convenience and aesthetic Hy-Vee is searching for this year. The group is a non-profit group of singers and do not take donations. They come and sing for the fun of it and enjoy what they do.